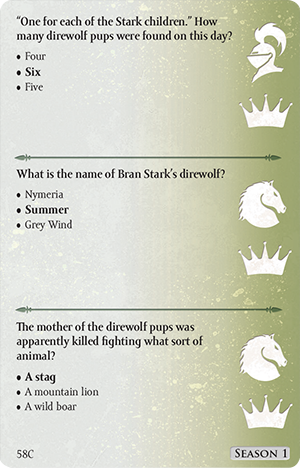 Fantasy Flight Games is proud to announce the upcoming release of Game of Thrones™: The Trivia Game, a competitive game of knowledge and strategy for two to four players or teams. 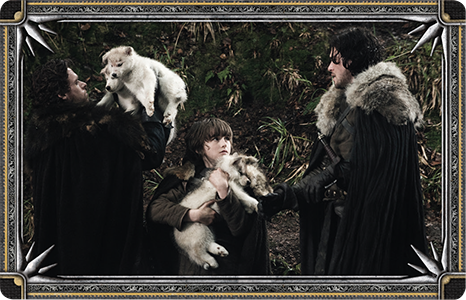 Some of the toughest competitors for the Iron Throne fight not with swords, dragons, or poisons, but with their minds. In Game of Thrones: The Trivia Game, you and your friends compete to rule the seven kingdoms using your knowledge of the hit HBO® series. By answering questions about the people, locations, and events of Game of Thrones’ first four seasons, you can conquer locations across Westeros, accumulate valuable resources, and earn the support of iconic characters like Arya Stark and Jamie Lannister. You may make mutually profitable alliances or pitilessly usurp your competitors. The player or team that controls the most locations at the game’s end wins! Kings Landing may be the capital of Westeros, but in order to claim the Iron Throne that sits within the Red Keep, you’ll have to conquer castles throughout the Seven Kingdoms. Each location has seven sections and each question you answer correctly gives you control of a single section. You can attempt to execute a swift and sudden takeover by answering two or three questions in a single turn. If you miss a single question, however, all your efforts that turn will prove futile. 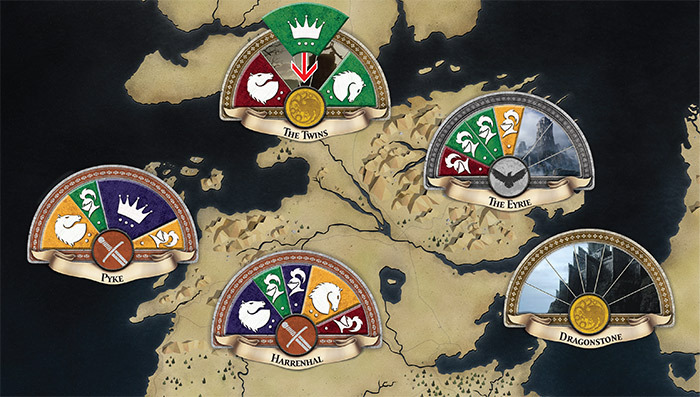 In the diagram above, the green player has lost battles at Harrenhal and Pyke to other players. Instead of attempting to conquer the ruin-covered island of Dragonstone, she turned her attention north, making some inroads at the Eyrie, but focusing on seizing the Twins. She chooses a large marker, indicating that she wants to answer three questions in a single turn. If she answers them all correctly, she can place her marker down and take control of the Twins. 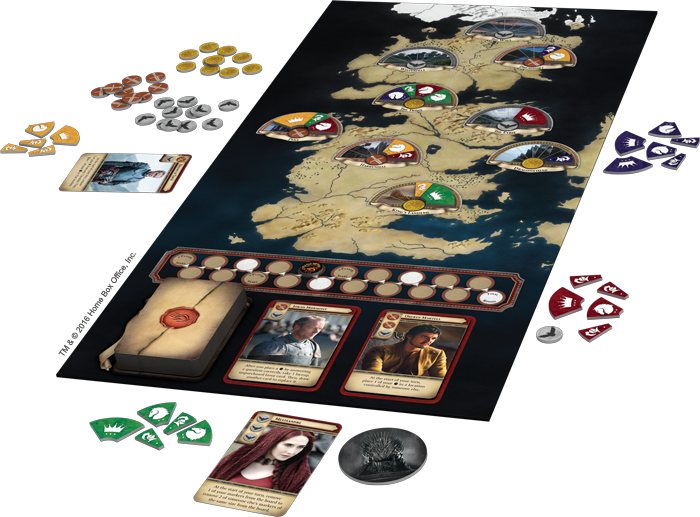 Game of Thrones: The Trivia Game includes over 1,200 questions, labeled by season so that you can play in order of the series to avoid spoiling seasons for players who haven’t seen them all, or shuffle all cards together for an encompassing game. Most cards are double-sided with three questions on each side. The type of marker you place determines which questions you answer. Small markers compel you to answer the first (and usually easiest) question, medium markers force you to answer the other two, and a large marker, all three. By choosing what size of marker to place, you also choose the difficulty of your questions. Some rounds are picture rounds. 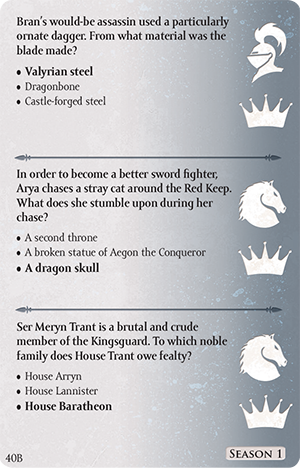 In these, all the questions on a card refer to a picture—maybe an moment from the show, maybe a house sigil or iconic location—on the front. Apart from that, picture cards are no different from any other, and can also be sorted according to season. Accurate knowledge is necessary to survive the cruel vicissitudes of war in Westeros and may suffice to grant you victory under the basic rules. When playing with the advanced rules, however, knowledge alone is not enough. You must amass material resources, spend them wisely, and gain the military, political, and financial help of supporters throughout the realm. 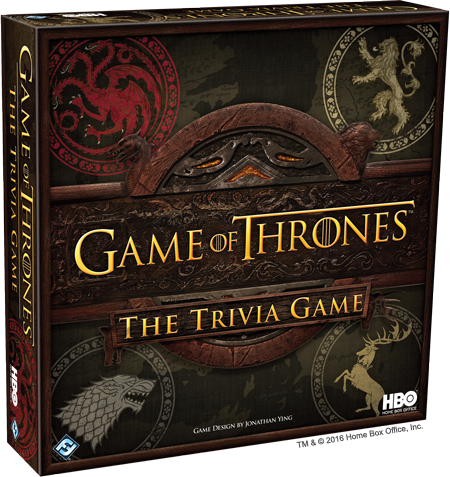 Game of Thrones: The Trivia Game connects resources, support, and knowledge together, so that even if your knowledge is momentarily insufficient, you can still remain a formidable competitor. For every question you answer correctly in the advanced version, you gain a resource: either a raven, sword, or piece of gold. You can then spend these resources to win the favor of powerful, iconic characters from the HBO® series. Each favor card offers you a unique ability to use at a critical moment. But allegiances are constantly shifting and loyalty bought by wealth is notoriously unreliable, so you must discard your favor card after a single use. In your quest to rule Westeros there may also be times when forming an alliance with another competitor can benefit you both. Under the advanced rules, after hearing a question that you feel you may not be able to answer, you can ask another player for assistance, promising them that question’s resource in return. Everything else gained from that question, including control of a location, remains yours, and once the question is answered, the alliance is over. Form your alliances with caution and cunning. Would gaining a resource enable your ally to defeat you elsewhere? Once the question is answered, should you turn your back on your ally and remove their marker from the board? A misplaced trust could easily prove your downfall, just as a well-formed—or conveniently broken—alliance may let you win the game. 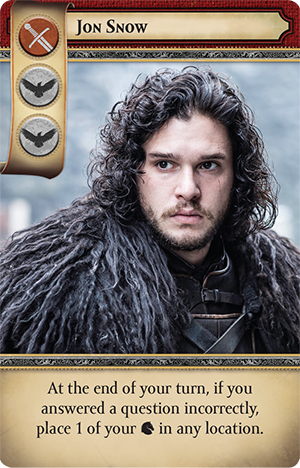 Game of Thrones: The Trivia Game will be available in the first quarter of 2016. 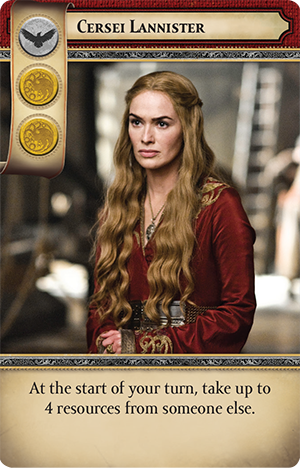 Game of Thrones: The Trivia Game lets you use your knowledge to compete for the Iron Throne. Answer questions about the hit HBO® series in order to conquer key locations in Westeros, enlisting the help of iconic characters along the way. Whoever controls the most locations in the Seven Kingdoms wins!